St Michael Paternoster Royal is on College Street, and the gardens that now lay to its immediate south would have been occupied by St Martin Vintry. 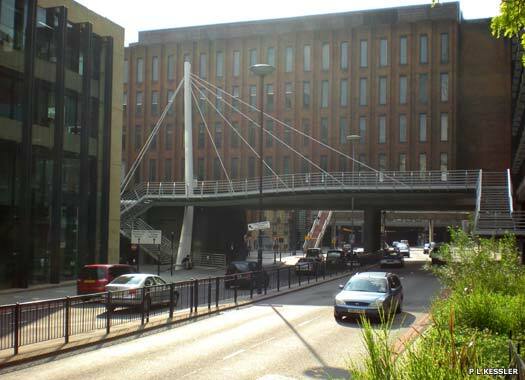 The site was on the bank of the Thames in Roman London, but by the thirteenth century St Michael existed here. Richard Whittington, four times mayor of London, rebuilt the church in 1409 at his own expense, perhaps also fitting six bells in the tower. He was buried in the church in 1423 from his house which lay immediately behind it. The church's dedication came from College Street, which was formerly known as Paternoster Lane. The Great Fire of London destroyed the church in 1666, along with Whittington's tomb. In 1694 rebuilding work on the replacement was completed. The 128-foot tower was added in 1713, and the church was restored in 1866. It was damaged severely during the Blitz in 1940, but was made good in 1966-1968. The church is also the central office of The Mission to Seafarers. 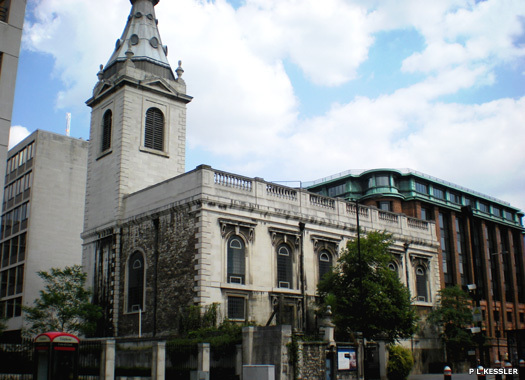 St James Garlickhythe is on Upper Thames Street at the northern junction with Garlick Hill, approximately eighty metres (yards) west of St Michael. Its dedication derives from the Saxon word 'hythe' which was used to describe a landing place or jetty (the Thames reached up this far during the Roman period). Garlic, a vital preservative and medicine in the Middle Ages, was unloaded here and probably traded on Garlick Hill, where the church now stands. The church possibly dates to the late Saxon period. It was rebuilt in the fourteenth century and destroyed by the Great Fire. 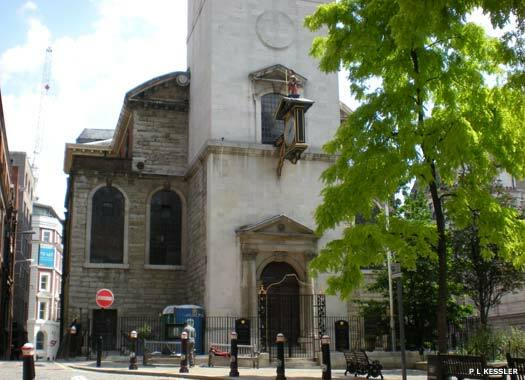 The foundation stone of Wren's replacement church was laid in 1676 and the re-opening took place on 10 December 1682, although the tower was not completed until 1717. During the Second World War a 500lb bomb buried itself in the south-east corner of the church but failed to explode. In 1991, damage was done by a nearby crane. 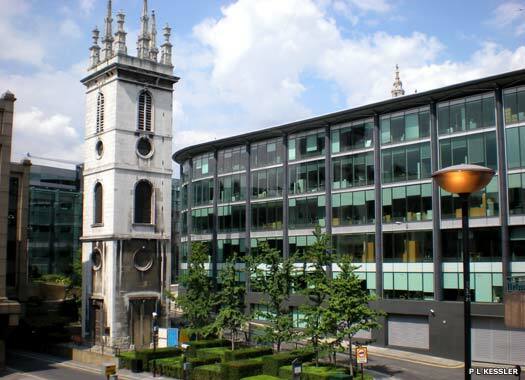 St Michael Queenhithe formerly stood approximately sixty metres (yards) west of St James on the north side of Upper Thames Street (on the right, under the footbridge), directly opposite Queenhithe (jetty). It was first recorded in the twelfth century, as St Michael Aedredeshuda (the dedication was an earlier name for Queenhithe), and destroyed by the Great Fire. It was rebuilt by Wren in 1676-1686 but demolished in 1876 after City population levels fell off drastically. 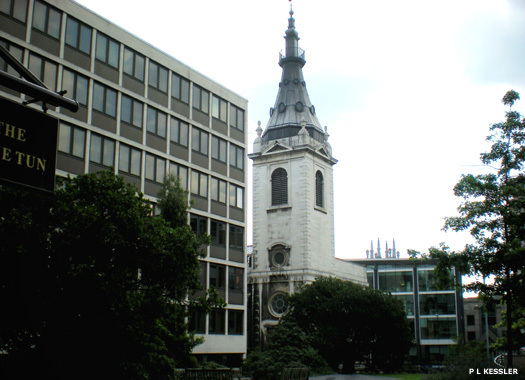 St Mary Somerset lies further west, just north of Upper Thames Street, between Castle Baynard Street and Lambeth Hill. It may have derived its name from one Ralph de Sumery, or a landing place on the Thames named Summer's Hithe, and was first recorded in the twelfth century. 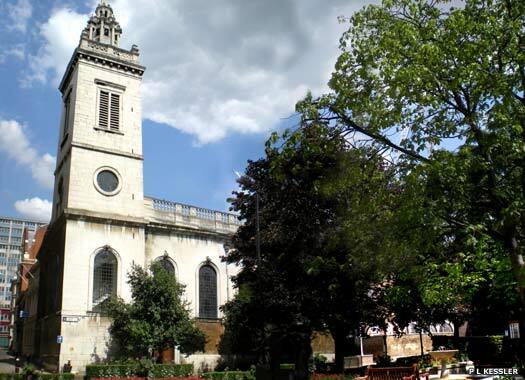 The church was severely damaged by the Great Fire of 1666 and then rebuilt by Sir Christopher Wren, with work starting in 1686. The church was re-opened in 1694, but not without problems. The political instability caused by the Glorious Revolution in 1688 temporarily halted rebuilding, but only for a year or so before it could be continued. During the late eighteenth century the church had a reputation for its Low Church leanings, and was criticised for it. Falling population levels meant the church was one of those selected to be closed in 1867. 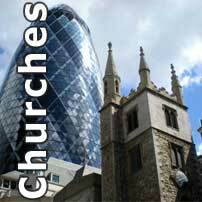 In 1869-1874 the church body was demolished, leaving just the tower standing at 36.5 metres (120 feet). St Mary Mounthaw stood on Lambeth Hill, immediately north of St Mary Somerset, which can be seen peeping around the corner. It was originally built as a private family chapel and bore strong connections with the Boleyn family, possibly being their chapel. Anne Boleyn was buried in its churchyard. It became a parish church eventually, although when is unclear. Unfortunately, it was completely destroyed by the Great Fire and was not selected for rebuilding. 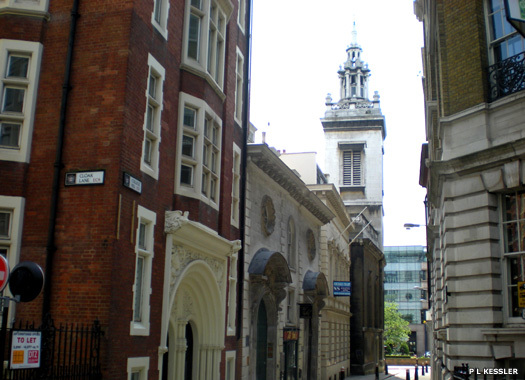 St Nicholas Cole Abbey lies on the north side of Queen Victoria Street, opposite St Mary Mounthaw's former site, and is just visible from St Paul's Cathedral. It was first recorded in 1144, with a dedication which is probably a corruption of 'Cold Harbour', a medieval lodging house for travellers which was most likely located close to the church. From the late thirteenth century it was recorded as St Nicholas-behind-Fish Street, thanks to a local fish market. 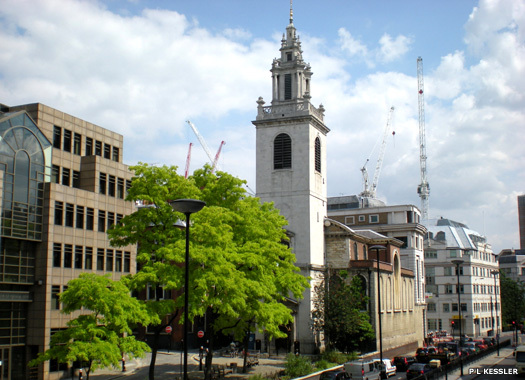 The church was destroyed in the Great Fire and rebuilding work was handled by Christopher Wren between the years 1672-1678. 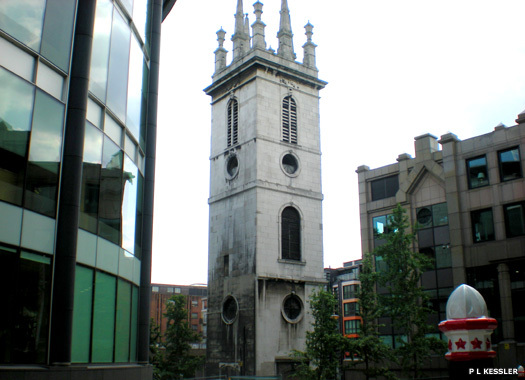 In fact, St Nicholas was one of the very first City churches to be designed by Wren. It was damaged by enemy bombing in the Second World War. Restoration work was completed in 1962, but the church was not reopened for worship. 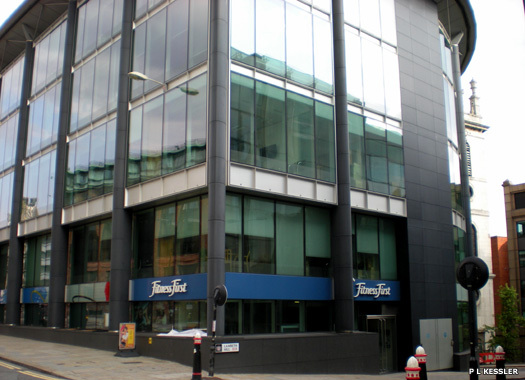 Instead, by 2009, it was hoped that the building could be converted into a national centre for religious education. Additional editing to one photo on this page by Dana Grohol.